Gathering My Roses: NOVICA: Review & Giveaway, CLOSED! NOVICA: Review & Giveaway, CLOSED! Our family loves National Geographic! We read the magazines -- watch the TV shows and specials. It's been a part of our lives for many years. When we discovered the beautifully crafted items at Novica (in Association with National Geographic), we were delighted and amazed! We were even more delighted to be given an opportunity to review an item from Novica. We received the 6 Piece Cobalt Blue Highball Glasses for the purpose of review. The glasses are just beautiful. They are nicely weighted (something I really love) and the colour is superb. The glasses are a little over 6 1/2 inches tall and are blown glass. They are also dishwasher safe (top rack)! While I rarely drink (Mike doesn't drink at all) alcoholic beverages, we do love to set a nice table for special occassions. These gorgeous cobalt blue glasses make any dinner special. Iced tea works just as well in these glass as would whiskey! A soothing, tempered tone of cobalt invades this set of six highball glasses. Over thirty years of experience has resulted in Javier and Efrén's superior ability to create imaginative yet functional works, achieving an incredible clarity with the material. Please note that as each piece is individually handmade, slight variations in the shape and size of the glass are likely, making every item a distinct example of blown-glass craftsmanship. Tiny bubbles within the surface exemplify Canteras' singular, rustic technique. Novica caries so many amazing, unique items: Rugs, Home Decor, Sculpture, Mirrors, Musical Instruments, Games, and so much more. You'll spend hours day-dreaming your way through their catalog. You''ll want everything. I know that Liz and I do! NOVICA. The World is Your Market. The wonderful folks at Novica want to share their marvelous finds with you! So have they've generously offered one of our followers a chance to win a $50 GC to their store! @GeorgiaMist @novica Win a $50 GC from Novica and Gathering My Roses! This contest will be open from Friday, August 27th until Thursday, September 9th. Winner will be announced on Friday, September 10th. 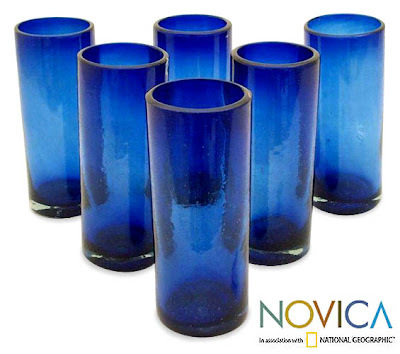 Novica provided us with a complimentary set of 6 Piece Cobalt Blue Highball Glasses for the purpose of review. We were under no obligation to review this item. We received no monetary compensation. The opinions expressed in this review are our own and based on our own personal use of the item. I love the hammock hanging chairs! I Follow Gathering My Roses PUBLICLY via Google Friend Connect, my name sswpss. I'd like to have the beautiful and unique Ceramic plate, 'Blue Chrysanthemum'! Touch the Earth silver ring is so cool! I love stone, so the serpentine sphere would probably be my first choice. The glasses you reviewed are pretty! I also really like the Sterling silver pendant necklace, 'Elephant Stack'! I follow Novica on Facebook (catalina khalaj). I follow @Novica on Twitter (ID @CKhalaj). I follow you publicly with Google Friend Connect (catalinak). I follow you via Facebook Networked Blogs (catalina khalaj). I follow @GeorgiaMist on Twitter (ID @CKhalaj). they are called "dance star"
I love to get the Sterling silver hoop earrings, 'Aztec Sun'! I love love love the cedar rocking chair. I'd like to have the Quartzite and peridot wrap bracelet, 'Butterfly Bloom'. Thanks for the nice review and giveaway. I really like this company. I'd get the Silver and leather necklace called 'Royal Peacock'. Beautiful products! I love the Cedar and leather chair, 'Lion's Head'. Thanks! I really, really like that Wood drum, 'Tinya'. What a unique looking instrument. I would love to hear that sound that thing creates! I LOVE the Wood chess set, 'On the Go' (medium). It looks like it would become a family heirloom. I like the pearl and carnelian glow necklace is my fave. I would love to have this tunic. I *Like* Novica on Facebook (Aimee Waerhouse). I am following Novica on Twitter (Nelsby). I am a public follower on Google Friend Connect (username Nelsby). I *Like* you on Facebook (Aimee Waerhouse). I love sunflowers, so I love the Decoupage chest, 'Sunflowers and Talavera'. I really love both the Natural fiber photo albums, 'Eco-Friendly Green' and the Garnet necklace, 'Sacred Red Lotus'. Their Bamboo boxes, 'Treasured Gifts' (set of 3) caught my eye for the living room! I like the Steel Book Stand, Inca Wisdom.